The great anthropologist Margaret Mead always described the formal rituals of the societies she studied as a way of illustrating the core values and mores of those societies. Had she studied the Britain of modern times the Wimbledon tennis fortnight would have been an essential ritual for her to examine - indeed sport and sporting events in general would be a rich source of material. In the United Kingdom there is a curious exercise underway, sponsored by Government, to try and identify "British Values" - the House of Lords even debated the subject last week. Quite what the point of this exercise is I am not sure - and whether they will have the honesty to report that an ingrained class structure is inherent in these values I doubt. But the truth is that aspirations that we could celebrate the creation of a "classless society" in Britain and the statement that "We are all Middle Class now", as former Deputy Prime Minister John Prescott once erroneously claimed, are very far from the mark indeed. Entrenched class distinctions are embedded in British society - and the rituals surrounding sport offer convenient shorthand for describing and explaining this phenomenon. Let's start with Wimbledon, which is a once a year celebration of the values and priorities of the British Middle Classes. For two weeks the men, and especially the women, of the leafiest suburbs descend on this otherwise forgettable corner of south-west London to watch world class tennis in pleasant surroundings. Wimbledon has a social ambience which whilst rather intimidating and eccentric to the outsider no doubt seems perfectly normal to them. 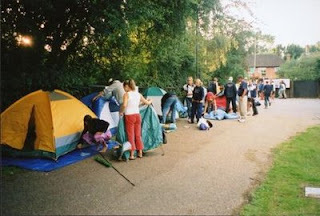 They queue overnight in tents for tickets, eat over-priced strawberries and cream and, if they are lucky, behave like the over-excited schoolgirls they once were if a British player is on the court. Their all-time hero was Tim Henman, a product of the same comfortably privileged background as them, who never reached the final but was the best British hope for years. Henman is gone now and there may not be quite the same enthusiasm for the only other Brit of any skill Andy Murray who is Scottish and dour - not a particularly popular combination amongst the middle classes in today's Britain. But if Murray does do well no doubt the Wimbledon matrons will take him gladly into their amble bosoms - even though they would be reluctant to do the same for Gordon Brown. The sport of choice of the proletariat is of course Association Football - "Soccer" as it is sometimes called - usually by those for whom "Rugger" (Rugby Union) is the real football game. Rugby Union is often called a hooligan's game played by gentlemen whereas soccer is a gentleman's game played by hooligans. (Rugby league is a hooligan's game played by hooligans). Indeed in the three British forms of the football game we have the class system neatly encapsulated. Rugger, Soccer, League - in that stacking order. Football, the most popular variety, is the very essence of a mass society phenomenon with its strange crowd and bonding rituals, fierce allegiances and obsessive behaviour. It also has its barriers to entry, or it did in the past - you wouldn't take your sister or girlfriend or mother to a professional football game. That has changed and the stadia are now more comfortable and, at a price, you can sit comfortably and enjoy the "beautiful game". But the odd minority "toff" element apart (especially at Chelsea) football is so quintessentially a working class supported game that it almost defines that social milieu. The working class minority sport equivalents of the upper classes horsey and field and water games require rather less money and equipment and have rather nosier crowds. Boxing, wrestling, snooker and darts bring out the working class spectators for a good night out and help fill the gaps on mainstream television if the boys decide to have a night in. All of this is, of course, a light-hearted and simplistic study of sport and class in Britain. There are some sports which transcend this sort of analysis and are perhaps genuinely classless (athletics and motorsport spring to mind). But it is to cricket that we must finally turn to show the reliability of the sport and class linkage theory. Cricket was once run by toffs - nearly every President of the MCC once had a title. But now it is mostly run by the same sort of chaps that you would see at Wimbledon or at the golf club. The MCC membership, whilst still exclusive by virtue of its long waiting list, is similarly middle-middle in its social positioning - as are many of the spectators, at Lord's at least. But the advent of One-Day cricket, and especially Twenty20, has widened the social mix at cricket considerably. There are even football chants at a Test match now and football shirts are as common as blazers (actually much more so). Cricket has traditionally prided itself on its classless appeal – and for years it was about the only place, and certainly the only sport, where toffs and the proles ever mixed. The "Gentlemen" and the "Players" distinction is gone but a big cricket match is still perhaps the one sporting event that mirrors British society - well male society anyway! The video the England and Wales Cricket Board tried to ban! This is the video that the absurd England and Wales Cricket Board tried to ban. It shows the dismissal of Daniel Vettori by Ryan Sidebottom at the Lord's Test match in May 2008. It is a self-made amateur video which I made on a small digital camera from my seat in the Pavilion! It was, of course, not made for commercial purposes and it was uploaded by me to YouTube just for fun and for general interest. The ECB then used a massive sledgehammer to crack this tiny nut instructing YouTube to remove the video because it infringed ECB copyright! I don't doubt that technically the ECB is right. But how utterly ludicrous that they should think it necessary to take action against a 61 year old diehard cricket fan who was just having fun! What tossers!